I saw fresh lychees in the supermarket this week for the first time in a while, and remembered how nice they are, if a little on the odd side. I had a phase where I bought all the various unusual types of fruit and gave them a go, and lychees are probably one of the most interesting. It’s got a nobbly skin that’s fairly hard. You have to peel the lychee to get to the fruit inside. The skin peels off very easily once you have got into it, and the fruit itself has a shiny white flesh which surrounds a brown pit, which is a bit like a date pit but shinier. I tried these fruit initially as someone suggested they were a good fruit for eating as a snack if you are trying to be healthy because it takes a bit of time to peel and get at the fruit. Lychees somewhat bizarrely taste like rose flavoured grapes. That sounds weird, but if you try one you will know exactly what I mean. I suppose they are an acquired taste, and not something I would eat every day, but they make a nice change. To keep the cost down you can also buy tinned lychees from the big supermarkets. Obviously all the hard work of peeling has been done here for you! They don’t taste quite the same tinned, but then nothing tinned is quite the same as fresh anyway. 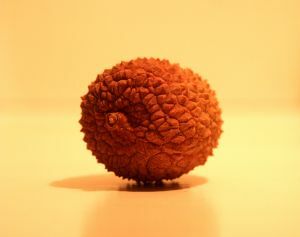 Lychees are native to China, Taiwan and Southeast Asia, although many other countries grow them now. In terms of nutrition, if you eat 9 lychees you will get your vitamin C requirement for the day. Lychees also provide the body with the minerals copper, potassium and phosphorus. So if you fancy trying something new why not give the lychee a go. Yes I think I first came across the fruit mentioned on diet forum for that very reason!